'Sister Clones' Of Dolly The Sheep Are Alive And Kicking : Shots - Health News Dolly, the first cloned mammal, had early arthritis and died young, raising concerns that clones age prematurely. But a study confirms the sheep's four sister clones are healthy and aging well. 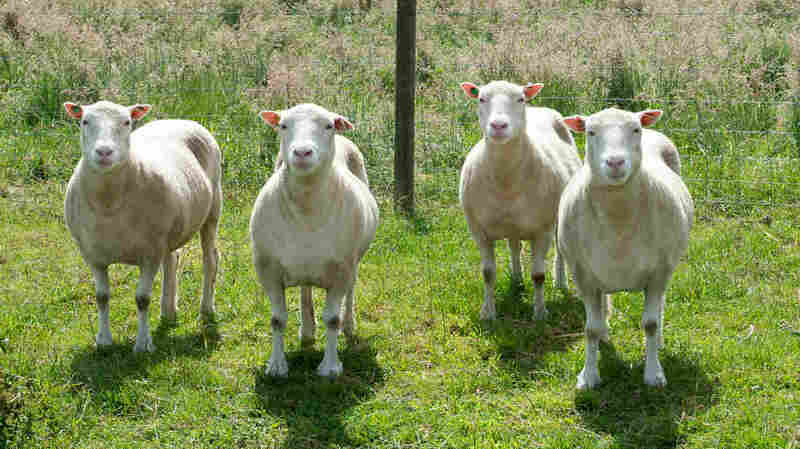 Four sheep cloned from the same genetic material as Dolly roam the paddocks in Nottingham, England. Dolly's life did not turn out as scientists in the cloning field hoped it would. She died young — 6 1/2 — with a nasty lung virus. "That was really just bad luck," Sinclair says, and had "nothing to do" with the fact that Dolly was a clone. But she also had osteoarthritis in her knees and rear hip at a surprisingly early age and the tips of her chromosomes were short — both signs that she'd aged more quickly than a normal sheep. "It provides another boost to those of us who are hoping this technology might someday be useful for conservation," says Shapiro, who recently wrote a book called How to Clone a Mammoth: The Science of De-Extinction. She's one of the scientists interested in cloning endangered animals to keep them from dying off, and also hopes to — maybe -- rescue species that have already gone extinct. As for the sheep clones in his care, Sinclair says "they will continue to lead normal sheep lives." Once they reach the ripe old age of about 10, they'll be euthanized and the researchers will do a detailed postmortem analysis of their bodies.